Sandwiches, fresh produce, and a whole lot of smoke. 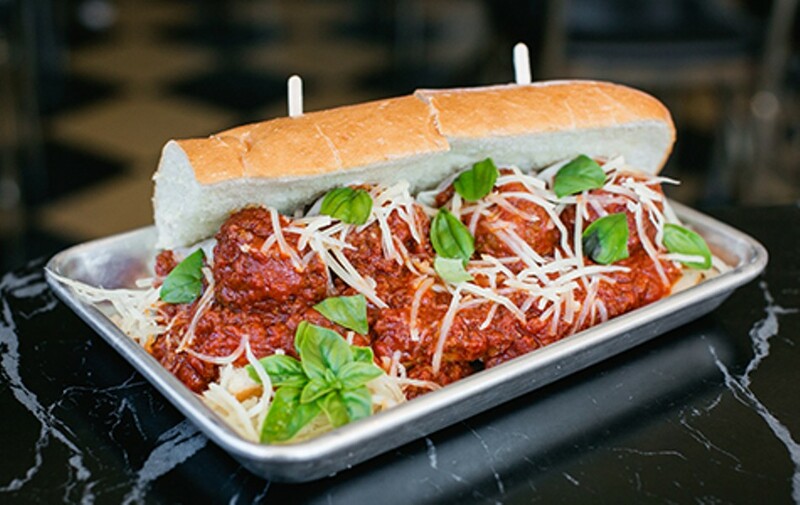 Andria Lo The meatball sub is a bargain at $8. The grocery section is small but well stocked. When I walked into Stay Gold Deli, a two-month-old delicatessen in West Oakland, the first thing I thought was, "This is one of the cutest restaurants I've ever seen." And it really is cute, what with the vintage pinball machine collection, the vinyl records arranged to form a kind of stylized wallpaper, and the large patio lined with picnic tables and, in a covered area in the back corner, a pool table and foosball table. In front, there's a small but well-stocked grocery section that might be the most adorable in the city — the kind whose commitment to creating the old-timey feel of a country general store is such that there are four or five vintage Coca-Cola mini fridges strategically placed around the perimeter of the room. 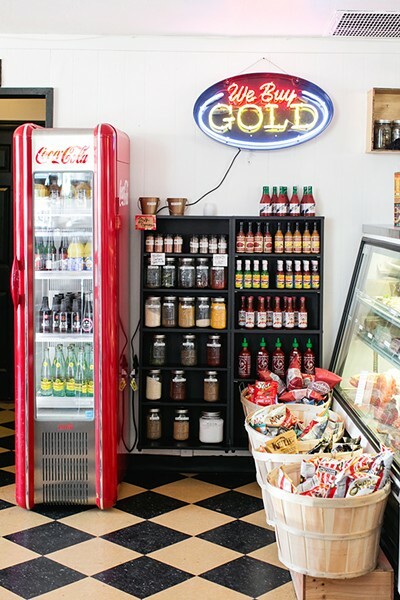 Co-owned by Jason Herbers (former proprietor of the punk venue Eli's Mile High Club), West Oakland native Michael Dright, and chef Stella Lane, Stay Gold is a deli, a sit-down restaurant, a coffee shop, a beer garden, and a grocery store all in one. When a restaurant or bar with this kind of carefully curated aesthetic opens in a mostly pre-gentrified stretch of West Oakland, it's par for the course to hear a few cries of "Damn hipsters taking over the city" — with a smattering of "That's a terrible neighborhood, why would they open there?" To be blunt: You could easily imagine that a place like Stay Gold Deli might cater almost exclusively to a mostly white, well-to-do, "New Oakland" customer base. And, given that the business is plopped smack in the middle of West Oakland, that would be a shame. But during my visits, the crowd was a racially diverse mix of young families, punks, and locals (not that any of those are mutually exclusive categories). Don't get me wrong, the "damn hipsters" are well represented — but the mix of people help keep the place from feeling too twee. What I appreciate, too, is the effort that the owners have put into making the deli feel like a truly egalitarian place. You can see that in the range of products they carry: Yes, you'll find Bicycle coffee beans, pricey Baia pasta, pristine-looking bunches of collard greens, little tubs of pâté, and all manner of house-made artisanally pickled things. But other items fall strictly into the realm of the everyday: Lucky Charms cereal, instant ramen, and endless jars of barbecue sauce — mostly Everett & Jones and Kinder's (i.e., the people's brands). I watched one guy come in off the street to buy a sandwich and a pack of cigarettes. Highbrow, lowbrow, middlebrow — this place has you covered. Perhaps most importantly, the price is right. I'm under no illusion that $8 or $10 for a sandwich is necessarily cheap for a lot of folks who live in and around West Oakland. But considering how good most of the food was, and the dearth of other high-quality dining options on this stretch of San Pablo Avenue, you would have a hard time finding many better deals in town. When I first heard about Stay Gold Deli, I was most excited about the fact that it was conceived, at least in part, as an Italian-American deli. After Genova Delicatessen's recent sad departure, Oakland really needed another place where you could get a classic Italian cold-cut sandwich, with oil and vinegar and the whole nine yards. And Stay Gold does serve a few variations on that theme: The "Butcher's Splendor," is a monster of a sandwich, loaded with assorted Boar's Head meats, fresh mozzarella, and red pepper relish. You get a big hit of vinegar in every bite, along with a tingle of chili heat from the hot capicola. Her Italian roots aside, most of Lane's professional cooking career has taken place in kitchens in Texas and Louisiana. It should come as no surprise, then, that many of the best things on Stay Gold's menu point more to the American South than they do to Little Italy. The most unlikely, and most delicious, sandwich I tried during my visits was the "Southern Gal," a daily special that consisted of smoked brisket, smoked cheddar, tomato country gravy, and decadently creamy mashed potatoes — I'd go so far as to say that the sandwich was 80 percent mashed potato. Who would think of such a thing? The pleasures of a hearty pot roast dinner with a healthy dose of smoke, all served on crusty bread. 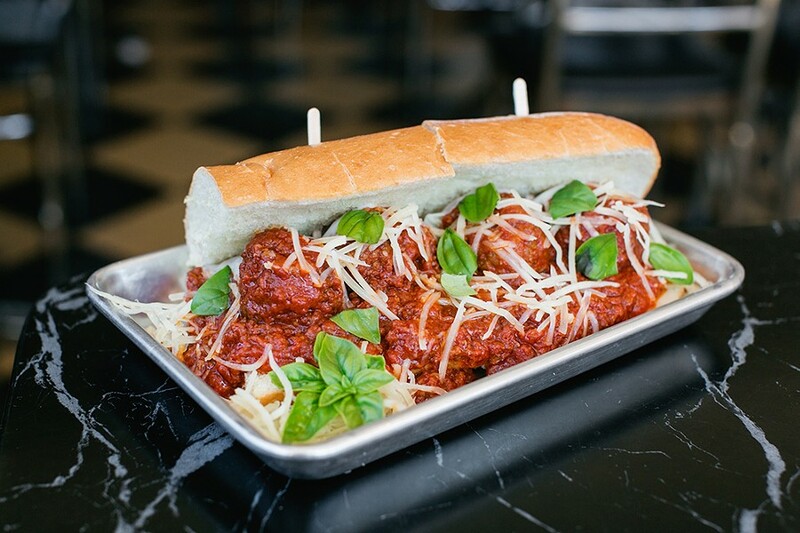 The staff member who took my order — co-owner Dright, I believe — warned me that this was the kind of rich, hearty sandwich that might knock me out for five or six days. He wasn't wrong. Other dishes with Southern accents include a savory bacon-and-collard-green bread pudding and a refreshing, light-on-the-mayo tuna salad sandwich that prominently featured smoked grapes — a trick Lane says she learned from an old chef named "Wildcat" that she worked for in Texas. Mainly, though, the restaurant isn't bound to any one particular food tradition. Just as the aforementioned brisket-and-mashed-potato combo was more a product of Lane's imagination than it was anything out of the Southern food canon, the chef takes a freewheeling, nondenominational approach when it comes to deciding what to put on the menu. One day, there might be smoked trout. On another, tasty (if smallish) pressed sandwiches with pork rillettes and Manchego cheese. Meanwhile, it's only fair to note that Stay Gold is technically still in soft-opening mode, with an official grand opening scheduled for late August. A dinner menu, with a few additional non-sandwich entrées, is in the works. And once Lane is finished working out the kinks with the restaurant's large built-in smoker, she says she'll start serving full-blown barbecue — Texas-style brisket and all. Might real-deal barbecue be on its way back to West Oakland? Given what I've already seen of Lane's skills with a smoker, I look forward to finding out.